May 16, 2015 May 16, 2015 Nefer Khepri, Ph. D.
My latest deck creation is The Turtle Lenormand. It is a traditional Lenormand, but has at least one turtle depicted on every card. Some turtles are realistically rendered while others are whimsical. The cards are all traditionally titled and work well with the traditional Lenormand interpretations. Directionality in reading the Clouds, Scythe and one version of The Book card have been maintained. I created The Turtle Lenormand simply because I have always loved turtles. 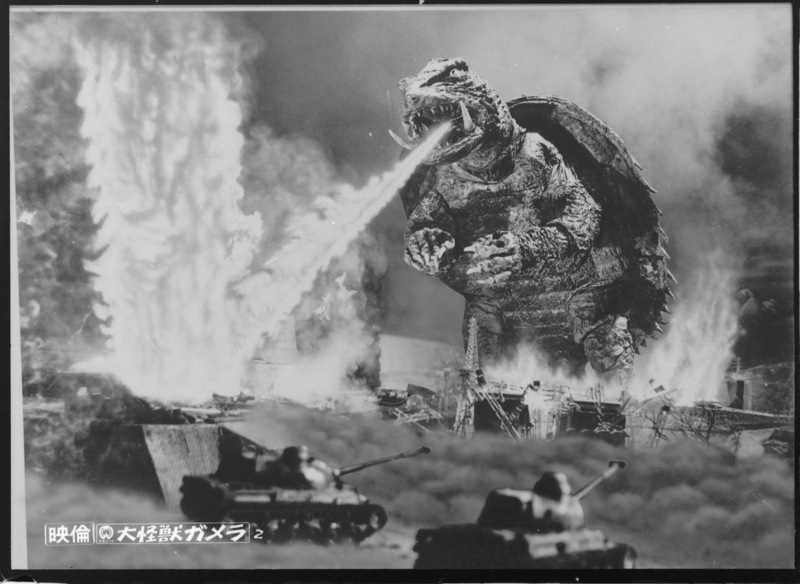 Gamera, from the original B&W film, “Gamera” (1965) taking out the Japanese military in fine turtle-y fashion. I had two turtles when I was little whom I assumed were a boy and a girl so I named them Mickey and Minnie. I’ve always really resonated with turtles and the neighborhood kids’ nickname for me was “Turtle.” I think it was seeing Gamera when I was 9 that really cinched my love of turtles. If you have never seen a Gamera movie, treat yourself sometime. They are done in the same vein as the Godzilla movies (kaiju). Yes, they are cheesy and somewhat campy, but they’re so much fun. Gamera is a giant prehistoric turtle in hibernation under the arctic ice when he is awoken by atomic blasts. Thus begins a movie franchise that has culminated in 12 films with rumors of a 13th film in the works (please, please, please!). 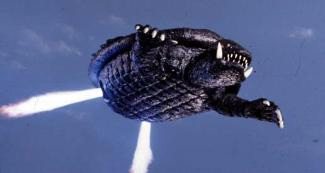 Gamera using his jet rockets to fly through the air. What kid wouldn’t love a flying turtle (yes, Gamera is so awesome that he FLIES and he has jet rockets!!). In addition to flying, Gamera can breathe fire and he loves children. One of his official titles is “Friend of All Children.” He’s a good guy. No wonder I have always loved turtles! 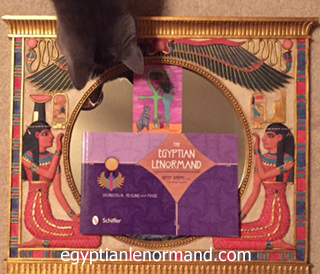 My cat checking out The Cat card of my “Egyptian Lenormand” (Schiffer Books, 2015). My first Lenormand deck, The Egyptian Lenormand, combined my two great loves: the ancient Egyptian civilization (a love that began also when I was 9 ~ coincidence??) with the Lenormand system of cartomancy. I figured for my second foray into deck creation why not combine my love of Lenormand with my love of turtles? Plus, I wanted a deck of nothing but turtles for myself, just as I had wanted an Egyptian-themed Lenormand for myself. 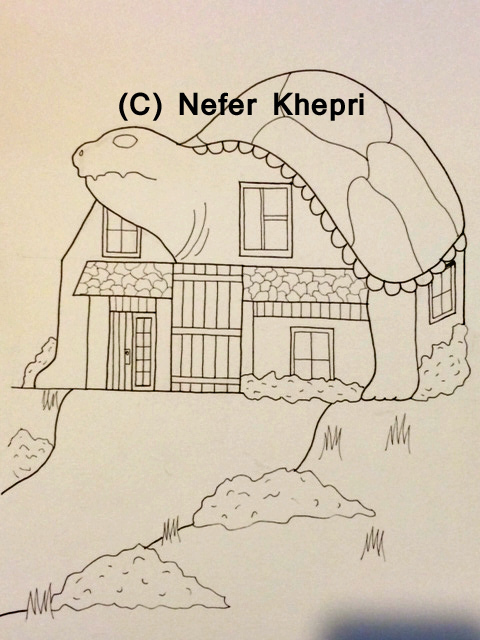 Final drawing of The House card for “The Turtle Lenormand,” copyright Nefer Khepri, 2015. Self-published. Available at http://turtle-lenormand.com. Hence, The Turtle Lenormand was conceived. The images first took form as a bunch of badly scribbled sketch-ideas I drew late one night when I was suffering from insomnia, and now those ideas have taken final form into drawings and card images. All images contained within The Turtle Lenormand are created on mixed media card stock. It’s a slightly heavier card stock than bristol smooth or bristol vellum and better allows for the blending of watercolor pencils without paper warp. I use a variety of artistic mediums ranging from polychromos pencils, watercolor pencils, Caran D’Ache watercolor crayons, to Copic Markers, acrylic paints, and fine line black Copic and Sakura drawing markers. I prefer to have a variety of artistic mediums at my disposal because each gives the piece a different look and feel. The Turtle Lenormand is available for immediate shipping worldwide. It is is a Special Limited Edition consisting of ONLY a 50 copy print run. Once these are gone I have no plans to reprint. Currently, only 28 copies remain in stock. Turtle Friends. 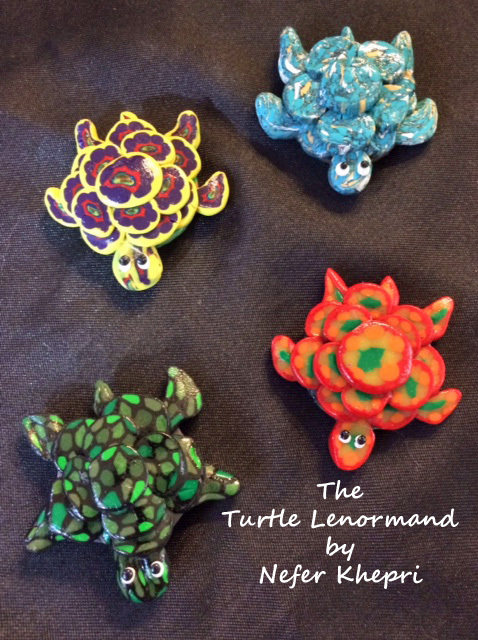 Polymer clay turtles created by Susan Keen Krontz exclusively for “The Turtle Lenormand” by Nefer Khepri (2015, self-published). The Turtle Lenormand is accompanied by additional cards (Dedication Card, Artist’s Bio Signature Card, and an extra version of The Rider, Clouds & Book). The Special Edition also comes with an extra turtle-ly surprise created specifically for my project by polymer clay artist, Susan Keen Krontz. The surprise is your own Turtle Friend that comes in its own pouch. There is one Turtle Friend per deck and no two are exactly alike. The deck is housed in its own pouch as well. The Turtle Lenormand is an Art Deck. What that means is this: every image was created by hand. Drawn by hand, colored by hand, and then tweaked by hand. The only time a computer becomes involved in the process at all is in the final scanning of the images into my computer so I can then send the images off to the printer. Each image requires AT LEAST 10 hours of combined research and drawing time. The process of coloring each image ranges with the complexity of the image. For example, The Tree card took me about 10 hours to complete because it’s a pretty simple design; however, The Clover card, which is more complicated, took me several days that combined for a total of 43 hours. In retrospect, as I think back to my childhood of watching the Saturday afternoon Creature Feature shows, and later while still growing up in the Chicagoland area, watching the Son of Svenghouli, I’d like to thank both of these shows for airing those old cheesy Japanese monster movies. We all are very familiar with the great Godzilla, but if it weren’t for the odd airing now & then I never would have heard of Gamera The Great. Any turtle who has rocket jets that allow him to fly through the air at great speed requires “The Great” as his epithet, wouldn’t you agree? Thank you, Gamera. Without you this turtle and Lenormand mash-up never would have occurred. 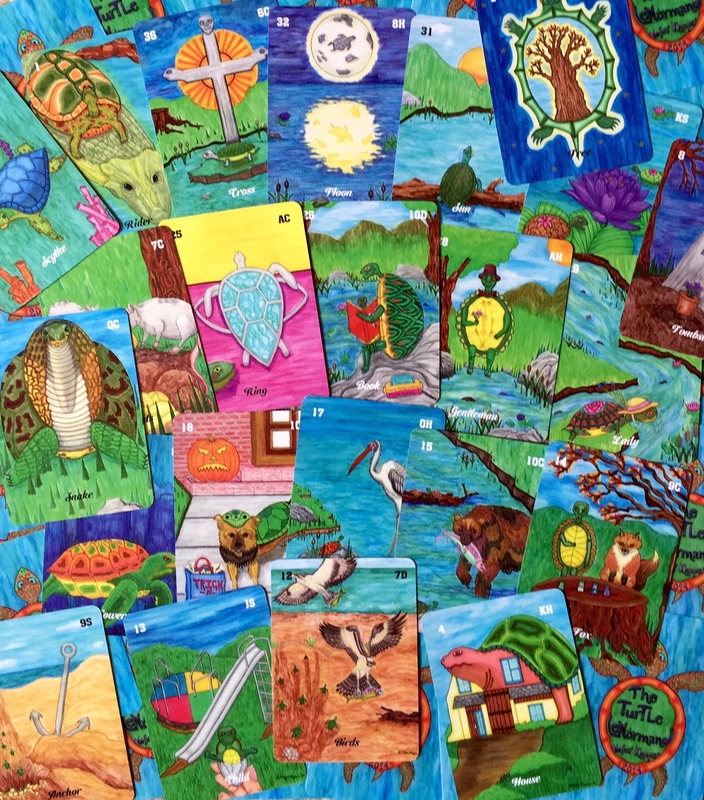 To order my Turtle Lenormand, please visit: http://turtle-lenormand.com. If you’d like to see Beth Henry’s video review of my deck, please visit her YouTube channel. I also have signed & activated copies of my Egyptian Lenormand (Schiffer Books, 2015 edition) available at http://egyptianlenormand.com. By “activated” that means I take your copy through the Activation Ceremony (which is fully explained in the accompanying guidebook) so that your deck arrives ready to be used not just for divination, but also for healing and magical manifestation, which makes my Egyptian Lenormand unique among Lenormand decks. Next Mercury Retrograde Dates for 2015. Great post! My Godzilla loving husband has a new quest. Long live Gamera the Great! And being a proud possessor of this lovely deck I can recommend it for clear reading too. That’s great! I love Gamera & if I can educate others about him & his great, campy movies, I’ve done my duty!